Freshbooks is a cloud-based invoicing, timekeeping, and billing solution. With the Freshbooks addon, you can sync your client list with your GoDaddy Email Marketing subscribers! If you don't already have an account, grab an account for free! Click on Addons at the top of any page and choose Add more. Scroll to the Freshbooks option, and turn it on. Click Go set it up. Enter your FreshBooks Subdomain, which is your personalized piece of the URL you use to access your Freshbooks account. Click the Authorize FreshBooks button to sync your accounts. You will be temporarily redirected to a Freshbooks login page. You need to enter your Freshbooks login credentials. Once accepted, you will be returned to your Freshbooks addon page. Click the Import contacts button to get your Freshbooks contacts into your subscribers area. You will receive an email when the import is finished. Head over to your Subscribers area. 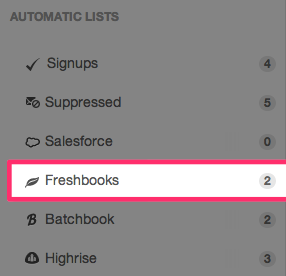 Your FreshBooks client list will now be available under the Automatic Lists in the left sidebar. Freshbooks client name, email, company, and phone data will be imported into your email list. These fields are fully searchable, just like your other subscribers records. How Do I View or Edit Contact Details?